Never Enough Nails: Happy Halloween!! Happy Halloween!!! Halloween is my favorite holiday, I absolutely love everything about it. I usually wear Halloween manis for the entire month of October, but with my dad being in the hospital I got so off track this year. 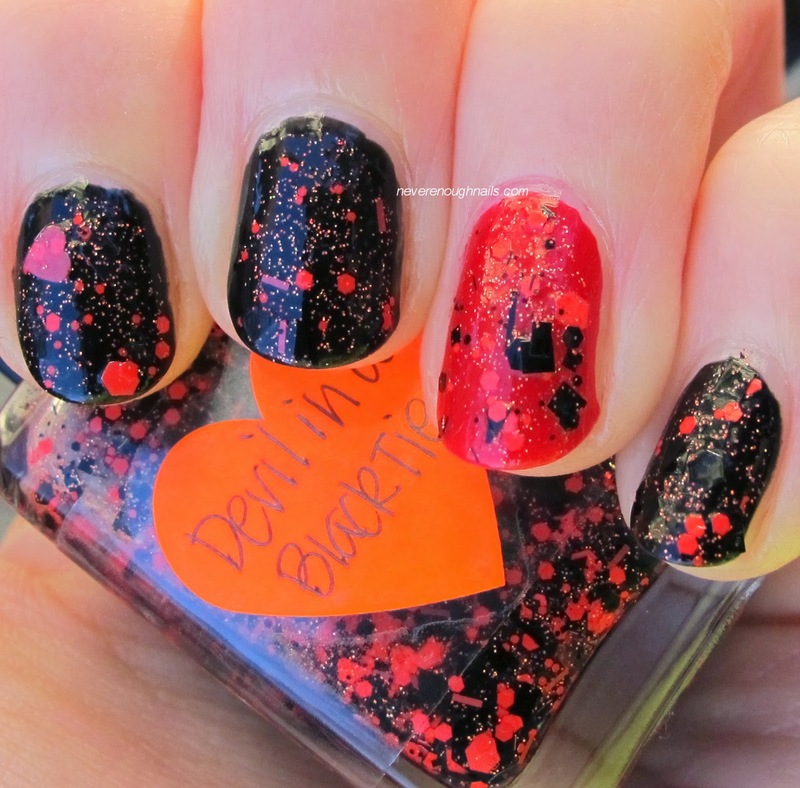 I'll be wearing Halloween polish well into November, haha. 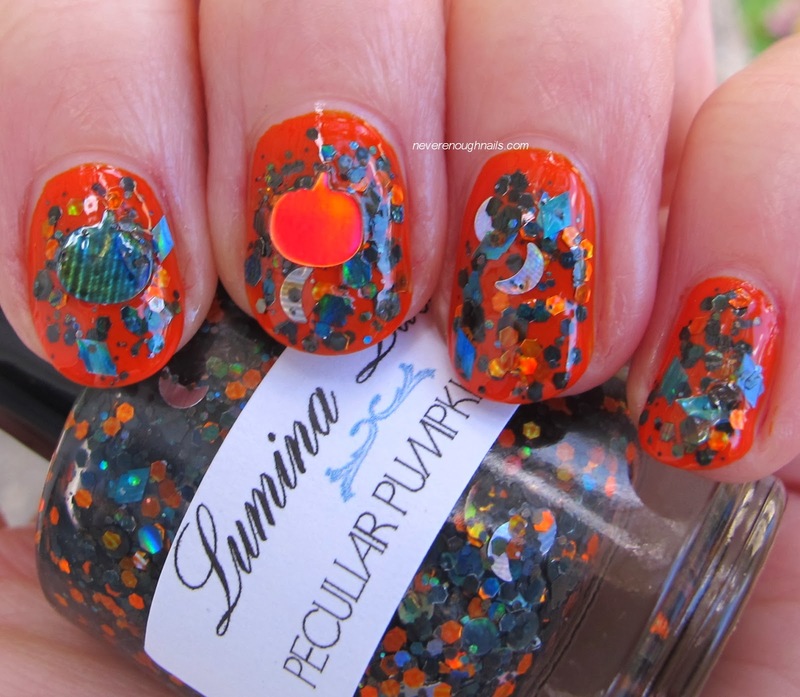 But I have a few recent Halloween manis for you, starting with Lumina Lacquer Peculiar Pumpkin Posse. 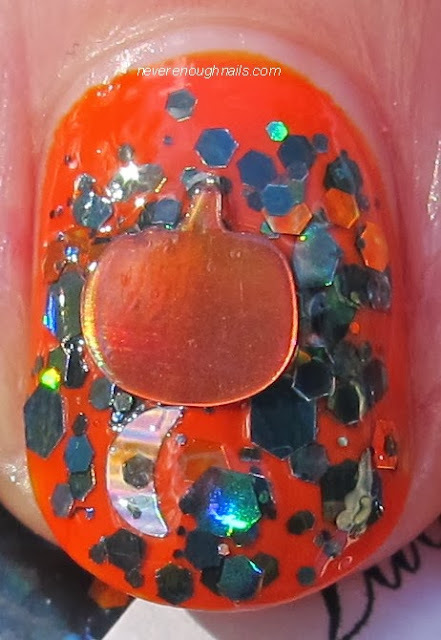 This is an all holo glitter topper of holo orange and black hexes, black holo dots, holo black diamonds, and orange and black holo pumpkins. Everything in this polish is holo!! It also comes with an extra bag of the orange and black pumpkins. 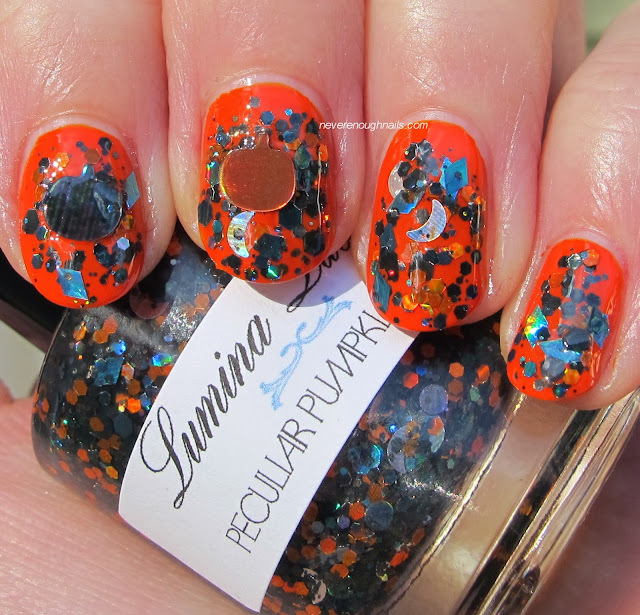 Like all Lumina Lacquers, Peculiar Pumpkin Posse is best applied by dabbing. 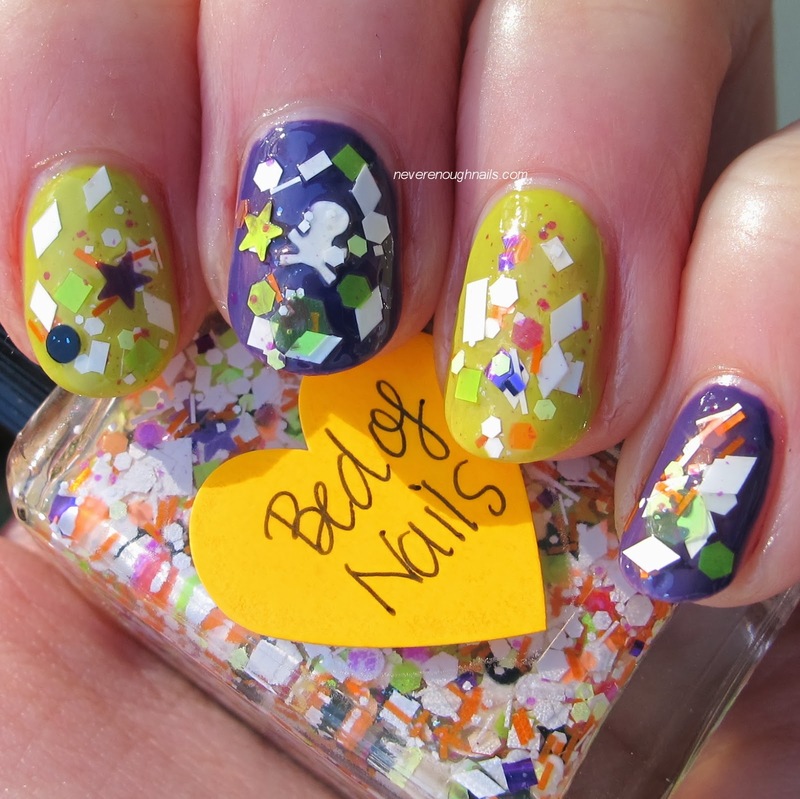 This is one dabbed coat with a few places filled in a second time, over OPI A Roll in the Hague. I took the two pumpkins from the extra bag of pumpkins, rather than fishing them out of the polish itself. There are plenty of them in the extra bag, so I figured it was easier and faster. I love the way the orange pumpkin is glowing in the picture below. Next up we have Lynnderella Bed of Nails. 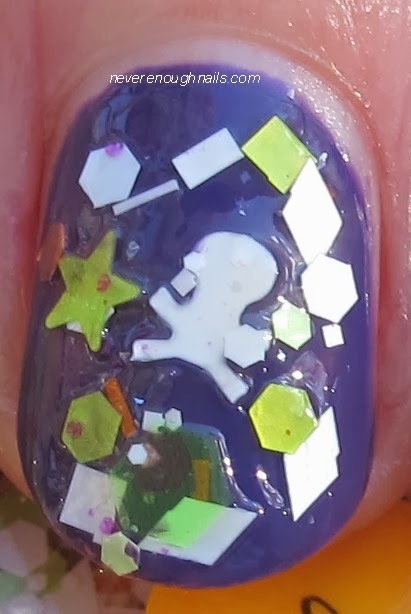 This is a unique mix of white glitter in various shapes and sizes (including skulls! 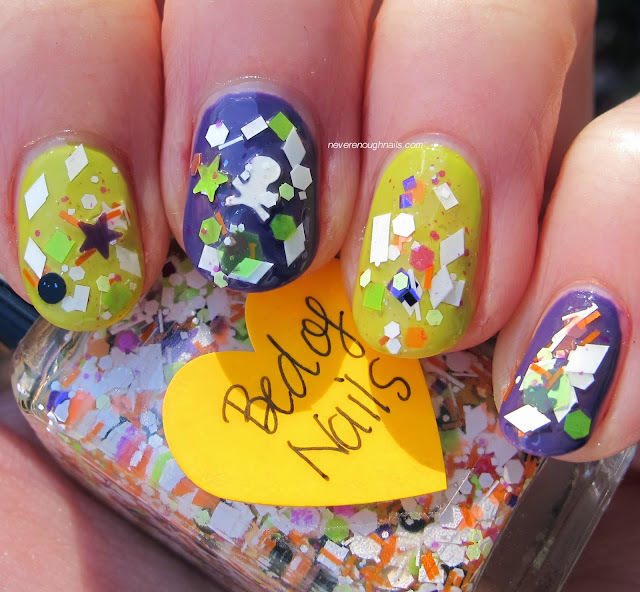 ), purple, green, black, pink, and orange glitters in a clear base. Orange, purple, green and black really scream Halloween for me, so this is perfect. 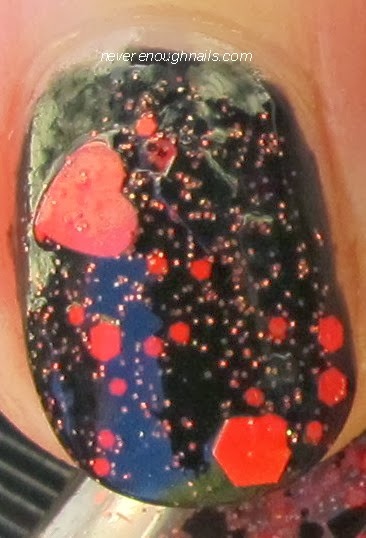 And I couldn't believe my eyes when I saw skull glitter in a core Lynnderella polish, I had a huge freak out moment! 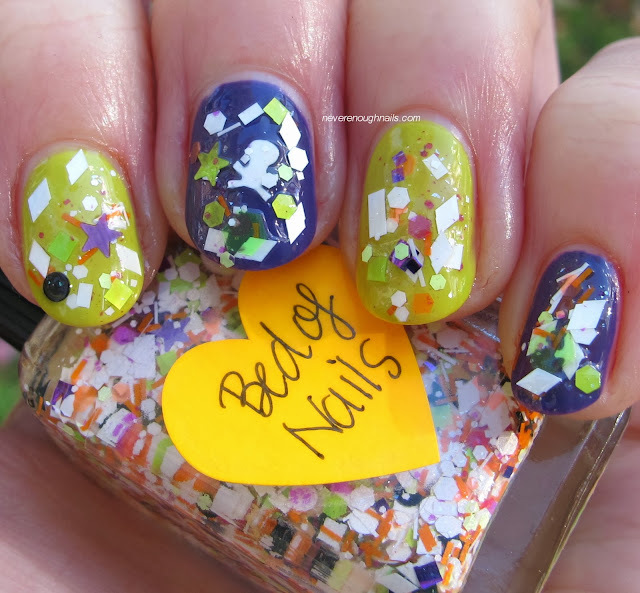 This is two dabbed coats of Bed of Nails over OPI Did It On 'Em and China Glaze Grape Pop. I had a little bit of trouble getting the glitter out at first, which is really unusual for a Lynn polish. I turned the bottle upside down for a few minutes and that definitely helped a lot. 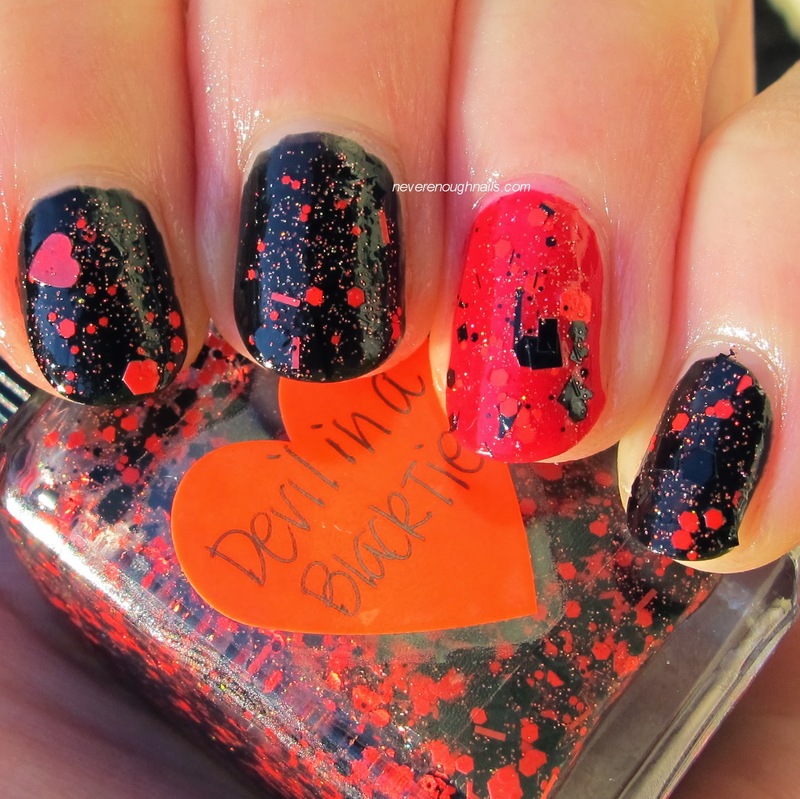 Finally we have Lynnderella Devil in a Black Tie over a random black Color Club mini and Zoya Livingston. 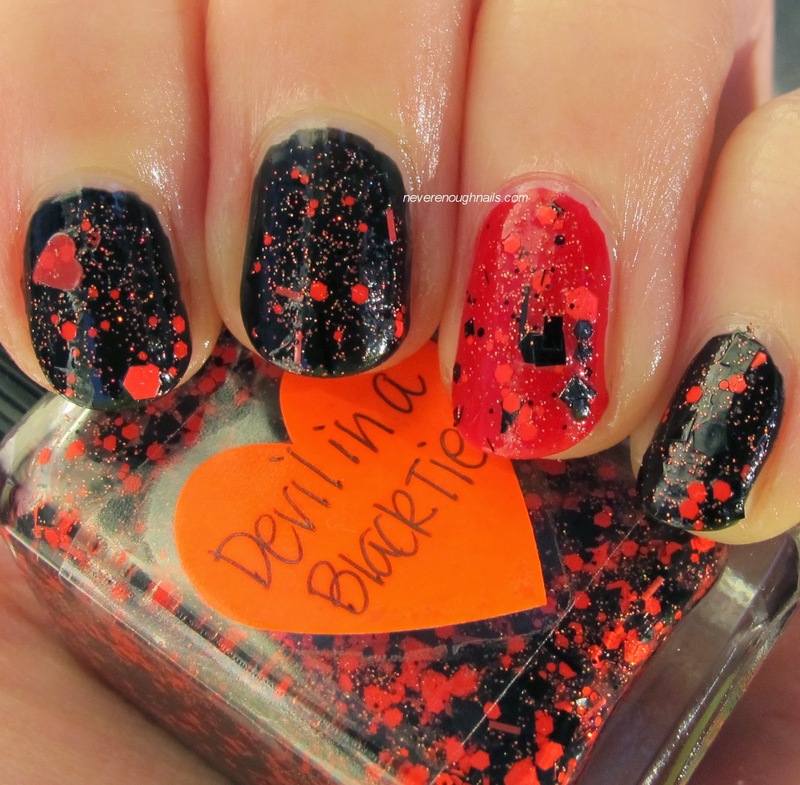 Devil in a Black Tie has black and red glitters in a crazy holo sparkled base. I couldn't capture the holo sparkle, but it was similar to the fine holo glitter in Lynnderella VamPink!. I guess I just didn't have the right light today. This is one coat of Devil in a Black Tie. It was easy to apply, no fishing involved. What are your plans for tonight? I will be dressing up, probably as a witch or something, and handing out candy while watching Hocus Pocus with Binx. I mean, it is Halloween, I have to hang out with my black cat! Lynnderella polishes are available on Lynnderella.com. 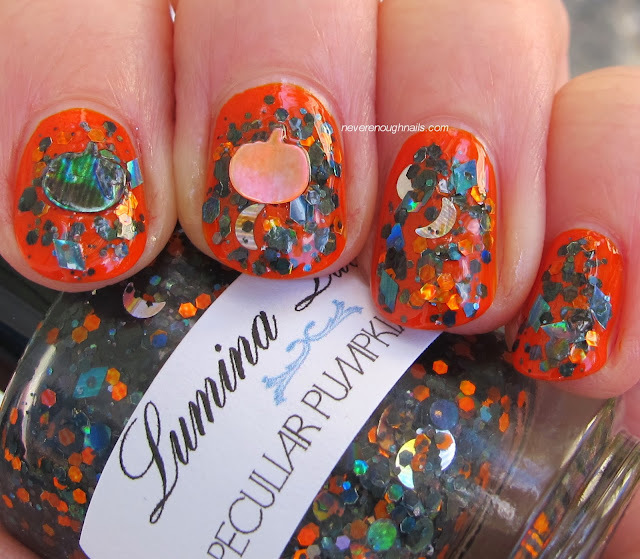 Lumina Lacquer Peculiar Pumpkin Posse is Limited Edition, but you might still be able to grab a bottle at the Lumina Lacquer Big Cartel store. OPI Mariah Carey Holiday 2013 Swatches, Part 2! OPI Mariah Carey Holiday 2013 Swatches, Part 1! OPI Take Ten Holiday Minis Gift Set! OPI Top This! Top Coat Set Swatches! OPI Announces Gwen Stefani Collection! !